Videogame publishers are understandably closeted about the success of their digitally distributed products, but given the number of free-to-play online worlds that are popping up on the internet each month, one wonders how, or if, any of these games are actually making substantial profit. Within just one month of its release Free Realms had amassed over 2 million users, and while we could ponder all day as to how large a percentage of those millions have (literally) bought into the game in a serious way, Sony’s family-friendly MMO not only has a distinctive enough style and approach to social gaming to set itself apart from most of its competitors, but an extremely wily business model that should see it continue to succeed for the foreseeable future. Most impressively, those screenshots you’ve likely been intrigued by are powered by a browser-based application, which runs as slickly as any other retail MMO, and is graphically on par with the likes of World of Warcraft and Warhammer Online. Installing the game is relatively painless, though I did suffer a few persistent authorisation issues with Vista, and players can create an avatar (human or fairy) and be exploring the game within ten minutes. 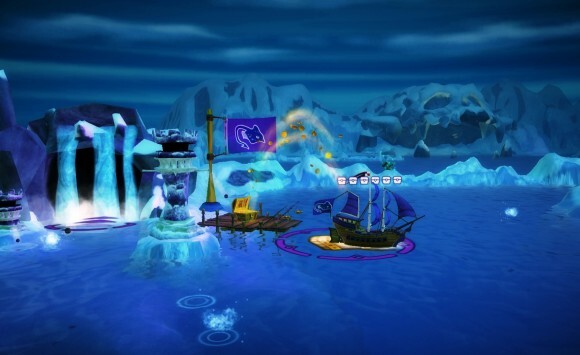 Free Realms continuously streams new or unexplored content while you play, so aside from a brief wait whenever you access a new location, loading times are kept to a minimum. Stylistically, Free Realms is a cross between Kingdom Hearts and The Sims, with pleasant landscapes and imaginative creatures mixed with anime-inspired human characters. Be prepared to see robgoblins (a bit like hobgoblins but with polka-dotted bras and kitchen appliances on their heads) and giant wolves inhabiting the same environment as go-karts and designer trainers. The entire world is an unrestrained mish-mash of elements from every gaming style and genre, yet it’s refreshing and it works. Rather than go through the various classes you can play in a mechanical fashion, I’ll initially concentrate on two activities new players can look forward to: owning a pet and driving a kart. Adopting a pet is one of the very first things your human or fairy avatar will do, and the furry critter you adopt acts as the sort of more sophisticated Tamagochi virtual animal that the Nintendo DS previously oversaturated. As well as grooming, feeding and dressing up your pet in ridiculous costumes you can get it to perform tricks by drawing an image with the mouse, also in the style of a DS game. But after you’ve bonded with your new four-legged companion (cat or dog), things get a little emotional. You see, the pet you’ve just trained was only a trial animal, and unless you’re willing to buy one with real-world money (converted into Station Cash) the most you can do is adopt one animal for twenty minutes every few hours. While a pet only costs a few dollars, it does feel like a cruel ploy to lure small children into falling for a virtual best friend, only to discover that mummy, daddy and their plastic lifeline will need to get involved – though, debatably, such a strategy forms the backbone of free-to-play gaming. Fortunately, the other elements of Free Realms are far more accommodating to the financially deprived. In many cases, the Station Cash doesn’t enhance the game beyond aesthetic improvements, allowing you to buy spiffy costumes such as an aquanaut diving suit or a skull-emblazoned racing helmet, or daft potions that transform your avatar into a purple monster. There are also plenty of reward items and outfits that are earned through play rather than pence. The Kart racing is a far better example of what the game has to offer, providing both a Mario Kart styled racer and a destruction derby. The derby is especially entertaining, and through the keyboard isn’t ideal for this genre, there’s surprisingly little lag. Each class essentially offers a separate minigame, with your avatar switching costumes on the go. There isn’t much point to these wardrobe switched beyond a visual transformation, but as with much of Free Realm, it’s yet another element of the game that some will find entertaining. Combat is entirely optional and exclusive to the Brawler and Ninja classes, and attacking an enemy will take you to a separate enclosed instance where you must fulfil a set of conditions – knock out fifteen enemies without being knocked unconscious yourself, for example. Given Free Realm’s family-friendly stance, it isn‘t possible to kill enemies either, though situations where the objective is to beat a bear into a coma don’t really feel any more humane. There’s also a host of block-matching and Cooking Mama-inspired puzzle games, which feature in activities from cooking and mining to farming ad blacksmithing, and are reminiscent of a more refined Puzzle Pirates. Equally enticing are the card games, chess and checker boards dotted around the realm. The majority of these minigames earn you stardust, which contributes towards higher levels. But the best of these is the Card Dualist game, which has concurrently been released in real-world form. These tangible packs each include 50 units of Station Cash and a reward card, which makes it possible for young players whose parents are understandably reluctant to part with their credit cards to obtain pets and new accessories. Naturally, none of these minigames hold a candle to the very best of the genres they are based on, but all have enough substance to them to prove addictive – and almost all of them are superior to the shovelware persistently hitting the Wii and DS at retail prices. The racing element is no Mario Kart but is competent enough that you’ll happily return to it time and again, while the card games and combat portions are simple enough to be immediately grasped. Overall, the simple combat is Free Realm’s least successful element, as numerous other free-to-play titles (particularly Runes of Magic) offer a more advanced traditional MMO experience. Those who wish to stick to one class will find that each job lacks much in the way of variety – and there isn’t a great deal to do once you reach level 20 – but there are usually enough other activities available to distract you from this realisation. For those willing to pay a comparatively small subscription fee ($5 a month) there are several exclusive jobs – blacksmith, archer, medic, wizard, and warrior – as well as exclusive items, quests and advanced variations on the minigames. As wonderfully conceived and inviting as Free Realms is, it’s difficult not to imagine that behind this colourful and friendly exterior beats the heart of a callous corporate suit. 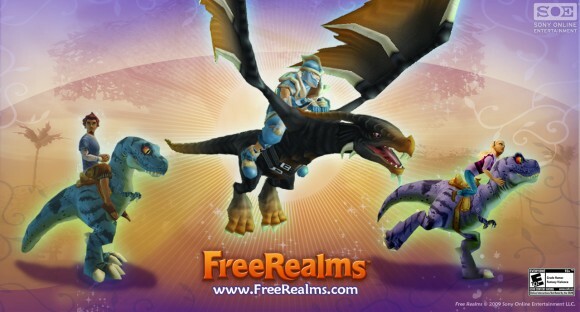 Okay, that’s a slight exaggeration, but make no mistake: Free Realms is a master class in merging “free-to-play” gaming with a shrewd business model. On the other hand, it’s hard to complain when so much is offered at no cost; the alternate is definitely worse. If the end result of micro-transaction reliant gaming is that those who don’t (or can’t) pay the monthly subscription get a slightly inferior experience to those who do, at least they get a complimentary experience that doesn’t require piracy. Reviewing an MMO is never easy, as it’s difficult to gauge the game’s lifespan from spending such a relatively small amount of time with it. Some elements of Free Realms worked better for me than others, but by cramming so many minigames into one big social package, Sony have crafted an online world that is more than the sum of its many parts. It’s a leisurely game, but deliberately so, and while I wonder whether the majority of minigames will endure continual replays for the sake of levelling up, Free Realms offers a polished and varied enough package to ensure you won’t regret spending a few weeks here; possibly far longer with friends. Older games might balk at its lack of long-term depth, but the younger target audience will be enchanted by the assorted activities and endearing character designs.